Good coworkers and charitable donations make life easier for the zoo director. If he uses the donations skillfully, he will acquire additional animals and vending stalls. If done right, he can make the zoo even more attractive and new to those who visit. In this way, he will attract more visitors and earn more income. With correct management fo these new resources, a player can become the Zoo BOSS. 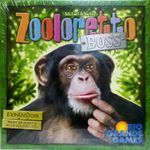 Expansion: must be played with Zooloretto! Contents: 5 expansion boards, 1 market board, 20 market tiles, 5 office boards, 12 coworkers, 30 donation tiles, 20 point tiles.